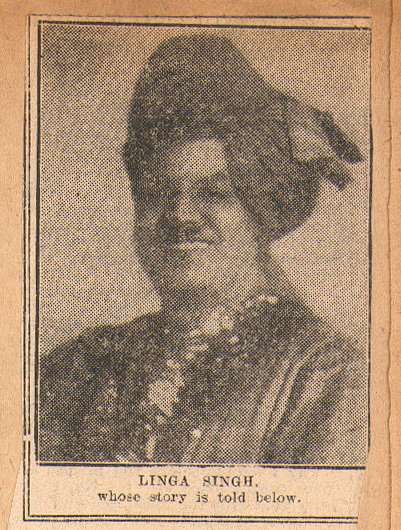 This article come from volume two of the magicians scrapbook, describing the life and career of Indian magician Linga Singh, reproduced on request of his Grandson who is researching his life. Exact date and publication is unknown, and as always content and view reflect the time. The circumstances under which Linga Singh came to be a stage “star” are the most romantic of any I have come across in a long career of writing for the stage. In the first place, none of his family back in India know that he is on the stage at all; the only relative who does know is his brother, who is a doctor in Manchester. 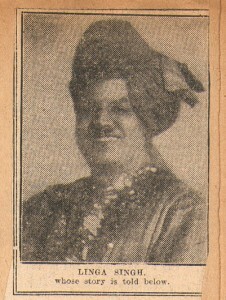 Linga Singh was sent to England by his father to study medicine. For that purpose he went to the great hospital in Edinburgh, which has turned out the finest doctors in the world. Here he studies medicine for a year or two- in fact until Chung Ling Soo, the wonderful magician, visited the town. As an Indian boy Linga Singh had seen of course, the tricks of the Indian Fakirs, the most marvellous magicians alive; and he had, as a matter of fact, dabbled in the business under the instructions of a Fakir. Accordingly, when the hospital students proposed to visit the theatre at which Chung Ling Soo was performing, Linga was not particularly elated at the idea. He knew too much of the “mysteries.” Anyway, he did go. And he watched the tricks. “Bah” he said to those about him, “I could do everything this man has done-every trick.” The students took up the challenge, and in the nice gentlemanly way that all students seem to inherit during Varsity or college days, proceeded to make that an excuse to create a fine disturbance. Well, the manager of the theatre came up in the gallery where they were and remonstrated with them. Their noisy reply was to the effect that they paid their money to see something they could not do, and here one of their own number was capable of giving the same performance. The manager gave it up. Presently Chung Ling Soo’s spokesman appeared on the stage, and in return for the giving of order offered to let the gentleman who said he could do all the tricks an opportunity of doing so. The offer was accepted for the Saturday matinee. Certain conditions were made: that Linga Singh should have the same assistance on the stage as Chung Ling Soo himself, and should use the materials the conjuror used, together with the assistants; in fact, that the show should be that of Chung Ling Soo, but with another Chung. This was agreed to, and so we come to Saturday afternoon. On the stage went Linga Singh; in the hall was a huge crowd of students, agog to see their colleague as a magician. Linga Singh ran through the agreed programme without failing in a single item. At the time Linga Singh did not pay particular notice to it, but later he decided to follow that advice, and so his native home-town in Punjab will never get the doctor that his parents thought they would. Linga Singh by the way, is of the ruling class of India. His father, a ruling Prince in our great Dependency, commended a troop of soldiers in the Indian Mutiny, and has a family of 25 sons and ten daughters. He lived to be well over 100 years old. But Linga Singh no longer belongs to his high caste. He married a French lady and went away from India and stayed away, and either of these two was sufficient to place him outside his people, and his heritage. On the subject of India government Linga Singh is entirely on the side of entire British rule. We Indians, he said cannot govern ourselves. We have not the brains, the understanding and education yet. If we had the understanding, do you think that out teeming millions would let themselves be ruled by the little handful of White Men out there? It is best as it is. When war broke out Linga Singh was one of the first to volunteer for the fighting line, and the King-Emperor. He had so many friends in Scotland that he joined the Argyle and Sutherland Highlanders, and wore a kilt. He must have looked a rummy sight! In fact he did look so rummy that the officers suggested he would look better if he joined a regiment of his own countrymen. Besides which, with them he might rise to a commission, or get one straight away. So to an Indian regiment he went. Of course accidents will happen even to the best of magicians, and sometimes tricks go wrong when they ought to be alright. I remember one neat little trick with which a very well-known gentleman used to amaze his audience. He would smash a plate to pieces by firing a pistol through a sheet of plate glass leaving the glass intact. There was no doubt at all that the only way the bullet could reach the plate was through the glass, and you could put the bullet into the pistol and watch that he did not take it out. After the trick the revolver could be examined, when it was seen that the bullet had indeed, been fired. One day the pistol mis-fired but the plate smashed in pieces all the same. The Girl and the Knife. Linga Singh has not had anything quite so bad as this happen, although once when he was on the point of producing snakes out of nowhere the snake was found to have wondered off from Nowhere, and could not, therefore be produced. He was found curled up round the steam radiator. But the most curious accident he had was in Belgium – and it occurred at a most unfortunate time. If you have seen this part of his act which he is doing at the Palace this week, you will remember that he hypnotises or pretends to hypnotise, his charming lady assistant – I think I will have to be a magician myself – places her on three huge Indian knife swords stuck point upwards in the stage and then removes the knifes supporting the legs and body, leaving the girl still lying straight through her shoulder-blades to keep her in the air. Linga, of course, chaffed him about it. “Oh it’s only a trick, you know,” he explained. They need not mind my hypnotism. You come in and see the performance tonight, and you will find the girl is alright.” The policeman came, and that night the trick went wrong. When the time came for the girl to be removed and the “hypnotic” spell to be broken, they could not get her off the knife. That, naturally, did the business in altogether.